UNIVERSAL CHARGING – Each port 5V 2.4A output (total 12A), 60W maximum total ports output allows you to charge 5 devices simultaneously. Compatible with most Apple, Samsung, LG, Nexus, HTC, and other smartphones and tablets. SMART CHARGING – Built-in intelligent chip provides identification on your devices and supply exact demanded current for charging. SAFETY CHARGING – Built-in high quality PVC copper wire, premium circuitry with over-voltage, over-current and short circuit protection. Multiple levels protections against overcharging, surges, and overheating, and compliant with FCC, CE, and UL. On/Off power switch integrated to provide extra safety. SPACE SAVING: Equipped with cable organizer helps user avoid the desktop mess and get rid of the cable cutter. organize multiple devices charging in one small station with anti-sliding slots and foldable baffles, makes good space saving. 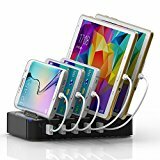 PACKAGE: 1x 5-port USB Charging Station; 1x Power Cable; 3x Android Micro USB Cables; 2x iPhone Cables[for iPhone 7 Plus, 6S Plus, 6 Plus, 6S, 6, 5S, SE]. * Fast charging, 5 ports every port maximum output reaches 5V 2.4A, good for charging whatever devices. * Smart charging, the built-in intelligent chip identifies smartly the connected devices and offer exact current charging, no need to select this or that port for phones and tablets. * Foldable baffles and anti-sliding slots makes perfect space saving and cable tidy. * FCC, CE and RoHS certified. Compliant with US and European safety and environment standard. Samsung: Galaxy S7 Plus,S7 Edge Plus, S7 Edge, S7, S6 edge Plus, S6 edge, S6, S5, S4, S3, S2, Note 5, Note 4, Note 2, etc. * For phones, iPods, Kindle, Bluetooth, headsets etc. whose rated input current is 1A only, you can charge 5 ports at the same time, that is fast charging. * The built-in intelligent chip can identify your devices and supplies correct current, don’t worry the 2.4A maximum output will damage 1A rated current devices. * For the slot size issue, some very big devices might not be able to put in the slot. Quality Guarantee: 12 months quality guarantee after delivery.